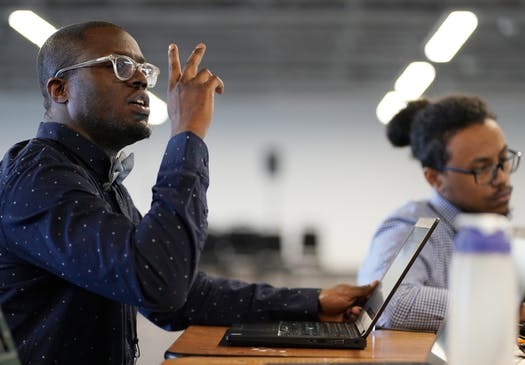 ‘This literally saved my life’ Gonkama Johnson, above, graduated in December from a free intensive technical training program offered by Atomic Data and Summit Academy OIC and aimed at students of color. Impatient, that is, with the Twin Cities labor market’s obstacles to hiring people of color and with its skilled-worker shortages. Gonkama Johnson may not know it, but he symbolizes the solution to two of the Twin Cities’ most vexing problems: racial disparity and worker shortage. The first problem is embarrassingly familiar. Minneapolis-St. Paul, despite its progressive reputation and relative affluence continues to suffer one of the nation’s widest and most persistent racial achievement gaps. People of color(African-Americans, especially) lag whites by far in almost every socioeconomic category, from educational attainment to employment to household income. The upshot is that the Twin Cities, more than its competitors, must forge a modern workforce from a limited labor pool that’s disproportionally disadvantaged —increasingly composed of people of color who, statistically at least, tend to do badly in school and lack the skills and resources to succeed. That’s where Gonkama Johnson comes in. He’s 30, born in Minneapolis to Liberian immigrant parents. He grew up in Brooklyn Park, quit Concordia University in St. Paul when he ran out of money and drifted through several low-paying jobs (and job rejections) before hitting the streets, homeless, in despair, mourning the deaths of his sister in Liberia and several local friends who succumbed to suicide and drug overdoses because, as Johnson put it, no one really cared enough about them. “I might have been on that same path, except for this,” Johnson said, telling the story of how one day last August he ducked into a corner store in Cedar-Riverside and noticed an advertisement for a new tech-training program — a free program. “This literally saved my life,” he said. As a boy, Johnson had loved tinkering with machines and later studying the workings and languages of computers. Despite his troubles, he was seldom unplugged, constantly pecking at his laptop to satisfy his techno-curiosity. Still, trips to several tech offices to drop off his résumé yielded only indifference. “No one ever called back,” Johnson said, assuming that the stereotype was correct, that tech companies were open almost exclusively to white and Asian men. But this new opportunity seemed radically different. He had stumbled across the launch of a novel joint venture of Atomic Data and Summit Academy OIC aimed directly at students of color. After rigorous screening, 20 to 30 applicants would be offered 20 weeks of intensive technology training, then all but guaranteed entry-level jobs at nearly $40,000 a year with full benefits at Atomic’s home base in downtown Minneapolis — no college degree necessary. The overall aim was quickly to move promising but disadvantaged young people into middle-class careers, debt-free, in an industry hungry for workers. The radical part was that this program would bypass the traditional community college pathway. Atomic, meanwhile, could survive in Minnesota by adding the skilled workers it needed to accommodate the growing demand for its services. CEO Jim Wolford saw a “golden confluence” in which Atomic could help solve a social problem while filling its vacancies. Wolford founded Atomic Data in 2001 but in recent years has grown dissatisfied with the quality of job candidates coming out of universities and tech schools. “They don’t know that they don’t know,” he said, complaining about having to extensively retrain and update new workers, and fretting over the lax attitudes of many privileged millennials who seemed less interested in the work than the perks (foosball, beer taps, bringing your dog to work, etc.). “It wasn’t working for us and our customers, so we decided to do it ourselves,” he said, acknowledging that the turning point came when Ted Mondale, Atomic’s director of new business development, recommended King as a partner. It took just nine months for Wolford and King to design and launch the program and five more months to graduate its first class. “These are impatient men,” Mondale said, explaining that neither tolerates Minnesota’s predilection for talking a problem to death. Indeed, it’s fair to say that, despite pressing needs on the disparity/workforce front, there has been far more talk than action. If so, then the time for investing is at hand, for the state, for nonprofits and for private business. The Atomic/Summit experience may offer a glimpse into the costs and rewards. For 20 weeks of intensive, tuition-free training, Wolford estimated a per-student cost of $12,000 — including $2,000 covered by a state grant to Summit, $6,000 directly from Atomic and $4,000 for the extra time his regular staff devotes to help train the students. That’s not much more than the cost of buying an ad and flying a candidate in for an interview, Wolford said, with no assurance that the candidate will take the job. As for rewards, Wolford said he’s getting a workforce that’s more loyal, will work harder and will stay longer. As for society, he said, it is getting a stable, contributing worker who’s adding to the economy, not subtracting from it. Of the 142 people who applied for the first Atomic/Summit class, 115 did not make the final cut, either because they failed one or both screening tests (general knowledge and computer literacy) or had criminal records (a disqualification for working in the highly security-conscious technology field). Gonkama Johnson failed one test the first time but was encouraged to try again. He passed. After he and 26 others began classes, eight more dropped out, including two women who, despite free tuition, couldn’t afford to pay for child care. Wolford began to more fully appreciate the degree of disadvantage even for the most qualified applicants. He stepped in to help several other students, including Johnson, who was homeless. In December, 19 students graduated. Johnson was among 17 who were offered jobs with Atomic Data. Johnson, one of the program’s most accomplished graduates, took the offer at $36,000 a year with full benefits and a chance to double that within five years. One reason was gratitude. “They gave me a chance, and now I’m on my way up,” he said. Another reason was comfort. During training he saw many faces at Atomic that looked like his. “I feel kind of self-liberated,” he said, “that as a person of color I can make it in tech, which has been seen as unattainable.” Most people he grew up with, he explained, had no clue that tech might be open to them. Now, he said, he wants to become an ambassador of sorts for young people of color interested in technology who have doubts about making it. A third reason he took the job was more basic. “I wanted to buy food and pay rent,” he said, surveying his new sleek office quarters and pondering his quick trip from the hopelessness of the streets to the brink of a middle-class life.